The Academy offered public policymakers actuarial expertise on health insurance, Social Security, retirement income, financial services, the National Flood Insurance Program (NFIP) and other issues ahead of Tuesday night’s State of the Union speech, which will be President Trump’s first. “As we learn the president’s priorities for 2018, and Congress debates proposals affecting the sustainability, design, and other aspects of these plans and systems, the Academy’s expert fellows are available to discuss their actuarial implications,” said Academy President Steve Alpert. Read the news release. The Life Illustrations Work Group (IWG) released a public policy practice note, Actuarial Standard of Practice No. 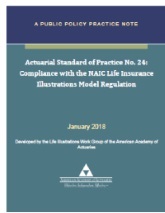 24: Compliance with the NAIC Life Insurance Illustrations Model Regulation. The IWG was charged with updating the practice note to better reflect current practices actuaries are using when complying with ASOP No. 24, which was revised and adopted by the Actuarial Standards Board in December 2016. The practice note incorporates and updates the Practice Note Addendum: Compliance with Actuarial Guideline XLIX, published in August 2015. The Individual and Small Group Markets Committee sent comments to the Office of the Assistant Secretary for Planning and Evaluation in response to the Department of Health and Human Services’ request for information on promoting health care choice and competition. The letter outlines conditions for a stable and sustainable individual health insurance market under Affordable Care Act (ACA) rules. Council on Professionalism member Kevin Dyke made a presentation Wednesday to the Actuarial Society of Michigan in Livonia, Mich. His presentation focused on developments in actuarial professionalism over the past year, the framework of the U.S. profession’s self-regulation, and the professionalism resources available to Academy members. The latest editions of the Life and Health Valuation Law Manual and the Property/Casualty Loss Reserve Law Manual are available. Order your copy today. The Life and Health Valuation Law Manual is designed to help appointed actuaries know the requirements of the NAIC model Standard Valuation Law and the Model Actuarial Opinion and Memorandum Regulation. The Property/Casualty Loss Reserve Law Manual is designed to help appointed actuaries know the NAIC Annual Statement requirements for statements of actuarial opinion. Both manuals are available in a variety of formats, allowing you to select the version that best suits your needs. Congress passed H.R. 195 on Monday—following a three-day shutdown of the federal government—providing appropriations for the federal government through Feb. 8. The legislation includes a six-year extension of the Children’s Health Insurance Program and a delay in the implementation of three health care taxes created by the ACA. President Trump signed the legislation into law, reopening the government. H.R. 195 also extended the NFIP through Feb. 8, following expiration of the flood insurance program’s statutory authority on Jan. 19, marking the fourth short-term extension of the NFIP since September. The early bird registration deadline for the 2018 Enrolled Actuaries Meeting is next Wednesday, Jan. 31. The meeting will be held April 8–11 in Washington, D.C. Register today. Annual Meeting and Public Policy Forum—Nov. 1–2, Washington, D.C.
A National Journal subscriber-only report on congressional measures to stabilize the health insurance market cites the Academy’s Dec. 12 letter to Congress on the consequences of eliminating the ACA’s individual mandate. JD Supra cited the Academy’s comment letter to the NAIC’s Statutory Accounting Principles Working Group expressing concerns over proposed changes to SSAP No. 62R: Property and Casualty Reinsurance. Several media outlets, including the Weather Network, Beach News (N.C.), and The Globe and Mail (Canada) reported on the newly released spring 2017 results from the Academy’s jointly sponsored Actuaries Climate Index, which provides a quarterly gauge of changes in extreme weather events and sea levels. A Health Affairs Blog post on the Labor Department’s proposed association health plan (AHP) rule cited the Individual and Small Group Markets Committee’s letter to Congress last March on AHPs. Several media outlets, including National Law Review, Lexology, and JD Supra, cited the committee’s issue brief on AHPs. The Academy’s issue brief, The 80% Pension Funding Standard Myth, was cited by numerous media outlets, including Voice of San Diego, California Political Review, and PublicCEO.